Well, this was a really good anime movie. I really like the story, about the Memory Rosary, the bad dudes, and of course Senna. I really liked her interaction with Ichigo, and it made me start thinking of shipping IchigoxSenna. Of course, she was a movie-only character... unfortunately. I liked the beginning of the plot, and how it moved along during the movie. Of course, they could've used at least twice the amount of time to give it some more meat around the bones, but they actually did pretty well the way they did it, and I'm satisfied with what came out. So, this is a great movie, and if you like Bleach, you shouldn't omit watching this movie. I found this movie to be very touching. It is best watched after episode 63, the end of the soul society rescue arc. The first thing you will notice is that it feels like a movie, and not just because of the beautiful animation. When someone is sent to soul society in the series, most of the time it feels routine; just something they always do. In the first scene, however, everything is different. I was completely moved. The main reason for this was the way they cut into the title screen. As I watched the girls' spirit rise through the air, they began playing an original theme song. I always say that anything can be enjoyed more when you feel the connection between audio and animation. From the moment I heard that song, I knew this film was one to be remembered. Bleach: Memories of Nobody is an unexpected treat that is very enjoyable, and does the series a great justice. An overall amazing movie. A generic, so Bleach-like story about blanks, a random girl getting kidnapped, and Ichigo going rambo one-man-army to save the poor kid. And yeah, expect to see the famous &quot;we-hog-screentime&quot; team, which is Hitsugaya, Renji, Matsumoto, Yumichika and Rukia. Byakuya makes a 1-minute appearance and Zaraki even gets cut!! Righhhhttt.. Personally I found nothing really great in Bleach: Memories of Nobody (MoN). The animation is not bad, but it's not extremely good too. The backgrounds are well drawn and somewhat beautiful to look at. The character design and environments are well done too. There are some issues here and there about badly drawn things, specially body parts. Like ridiculously small feet for example, or ridiculously small hands. Nothing very serious, but who strike out at you if you are careful. As always, I never really pay great attention to sound in anime. I didn't find anything bad here too. The sounds fit the storyline. The action scenes are ok, although sometimes the music lacks the energy, or the punch to really highlight the action. Character voices are satisfactory. And SFXs are used in the correct places. Nothing to complain here. Complaining comes afterwards. Now, I am gonna complain! I'm going to avoid spoilers, but I need to say it: The story is extremely predictable, if you have ever watched Bleach (anime) before. In fact, according to me, it's just the same as the Soul Society arc. Swap Rukia with Senna, swap Soul Society with the Whispers Canyon or whatever it was called. The 3/4 of the time of the movie is plain boring. They just elaborated on Senna and why the &quot;Dark Ones&quot; are around. No great details are given before the very end of the movie. You'll just sit there, and say &quot;Why doesn't it go faster?&quot;. And yes, if you are careful, you can know from the beginning itself what role Senna plays in the story. As you might guess, since she's the main female lead, she's got the principal role. Same as Rukia in S-Society arc. The ending of the movie, frankly, was expected. You have all the great battle scenes of the movie crammed in the last 20 minutes of the movie. 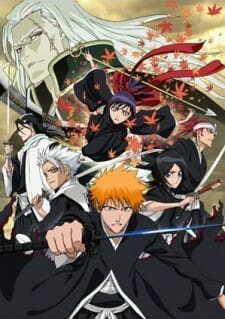 Just Ichigo and the usual team fighting the bad guys, and a soul society intervention at the very last moment. Sometimes, you ask yourself what the hell these guys of S-Society have been doing all this time. The characters, if you have watched Bleach, have no secrets now, excluding Senna. If there was one thing I liked about MoN is the character development. It was well done, slowly and feeding you the details droplets by droplets. It's kind of nice, and keeps you stuck to your screen till the end of the movie. Even at the very end, there are some more secrets revealed. Check the end of the credits too. A few seconds of video, just to ease up on the dramatic ending. Senna is a fun character to know about. A nice blend of humor, suspense and action makes her a cool character. Only negative point: She completely loses her fighting role at the end of MoN. Since the story was sooo predictable, I didn't really enjoy it. However, I appreciated the last battle scenes and the elaboration of the story. I've learnt not to expect too much from Bleach. Usually, the plots are very predictable and often mimic the Soul Society arc. MoN makes a good watch if you have nothing better to watch at that time (eg. no episode of your fav anime out). I gave 7/10 for some enjoyment value, beautiful backgrounds and good battle scenes at the very end. The story line is ok, although very predictable. And the Senna character is fun to watch evolve. Now, go check and rate for yourself. As always, thanks for reading my review! If you're a fan of the bleach series, this movie plays like an extended episode. For this reviewer, therein lies the problem. While this movie is to the untrained eye mediocre, I find it to be tacked-on. At the end of this movie the story has progressed no more than where it started. In fact it may have regressed, leaving more questions than answers,questions that surely will never be brought up again in the series. I am certain that no facet of this movie will even be mentioned by any primary, secondary, or even one of the huge numbers of 2D characters made up on the spot by the creators when they are needed to fill a plot-hole. The nail in this coffin is the fact that in the end of the movie, this is ensured. This movie is a morbid waste of time if you are looking for a good story, I would recommend renting or borrowing it, this by no means implies that you should spend any money to watch it. Furthermore, I would recommend playing Pong in the time you have allotted to watch this movie, as it has a better plot.